The Volcker Rule is here: It’s the first step to cutting big banks down to size. New regulations won’t do much to prevent financial crisis, but they’re a step toward shrinking America’s megabanks. Paul Volcker is a legendary figure in American finance for his work whipping inflation in the late-Carter and early-Reagan years. On Tuesday, more than three years after President Obama signed landmark legislation overhauling American financial regulation, the five regulatory bodies charged with formalizing the so-called Volcker Rule have reached agreement. The rule is a bit of an odd duck—not that intimately related to the financial crisis of 2007-08, but perhaps crucial to the path forward for regulation of the banking sector. The rule’s anomalous status in the firmament of Obama-era financial regulation starts with the name. Paul Volcker is a legendary figure in American finance for his work whipping inflation in the late-Carter and early-Reagan years. He’s also a Democrat, and someone the president brought on board in an advisory capacity to lend some luster to his economic recovery efforts. 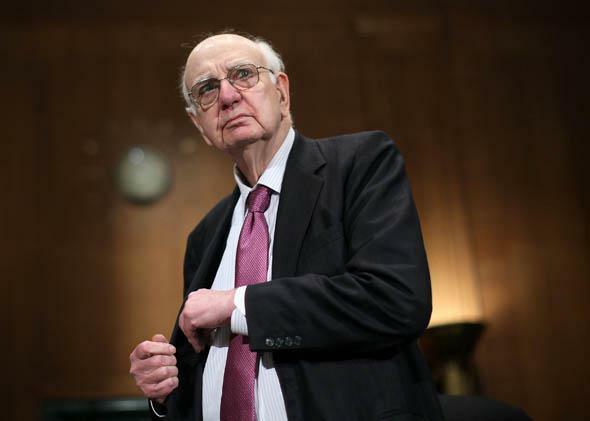 Volcker was never really a key member of the team, and his vision differed in a number of ways from that of Treasury Secretary Timothy Geithner, National Economic Council Chairman Larry Summers, Fed Chairman Ben Bernanke, and other main drivers of economic policy. But Volcker’s notion that financial institutions with insured deposits—banks, in other words—should be prohibited from engaged in the speculative trading we associate with hedge funds was what caught the president’s fancy. Finance critics on the Hill liked the idea, too. And even though neither Geithner nor Summers were enthusiastic about it, they both got on the bus eventually. Then, for years, it languished in bureaucratic obscurity. Congress ordered regulators to write a rule that would ban proprietary trading, in which banks try to make money by buying and selling securities, but allow two very similar things: The first, hedging, means buying and selling securities to offset risks. Airlines, for example, buy oil derivatives to reduce their exposure to the ups and downs of fuel prices. Banks were supposed to be allowed to keep doing this. The other permitted activity is market making, in which a bank agrees to serve as both a buyer and a seller of some security in order to ensure the existence of a liquid market. As five different regulatory agencies had to sign off on the text of a rule, it seemed likely that these exemptions would balloon into enormous loopholes. But then came a wave of pushback, and a final rule that banks are none-too-pleased with. How you should feel about it comes down largely to how you feel about major banks feeling sad. Beyond that, the arguments both for and against the rule are rather weak. The big problem with the Volcker Rule is that the underlying presupposition that trading was a major cause of the financial crisis is just wrong. Banks appear to have gotten into trouble for basically the same reason that so many mortgage borrowers ended up underwater: excessive optimism about the trajectory of house prices. Banal mortgage and commercial real-estate lending was the root cause of problems at both large and small banks, and the Volcker Rule does nothing to halt that. It’s a bit of a regulatory left hook, thrown unexpectedly at the industry rather than tailored to address a specific concern. On the other hand, the banks’ insistence that imposing this rule will somehow devastate liquidity and access to capital across the economy makes no sense. In New York, liquor stores labor under an arbitrary rule that they can’t sell beer. I have no idea what good this rule accomplishes, but it certainly doesn’t prevent people from buying beer. It just means other stores sell beer. By the same token, if banks are forced by regulators to abstain from profitable trades, then someone else will make them. Life will go on; it’s just that some specific firms will be disadvantaged. And that in some ways is what makes the Volcker Rule important. It’s not a major component of the Obama administration’s core objective of making a giant banking blowup less likely. But it is a step down a road Obama’s largely shied away from—a road where you don’t just try to improve the stability of the financial system but actually try to cut it down to size. A relatively tough Volcker Rule is politically viable because most banks won’t be handicapped by it at all—they’re small- or medium-sized institutions that do little or no trading and are happy to see their larger competitors get hurt. No discernable harm is done to anyone, while the biggest banks shrink a bit. If advocates of a larger transformation of the financial sector are to get their way in years to come, it will be through a series of Volcker-like measures—somewhat arbitrary, somewhat opportunistic efforts to exploit internal divisions within the banking world to hinder the growth of one sort of firm or another. No single step down this path will be necessary or sufficient on its own terms. But a bunch of them could shift the balance of power in the American economy.